In December 2002 the Arca-2 was released. This was a refinement and process shrink to 0.18u. Die size was a mere 5mm2 and clock speed benefited greatly from the smaller process node (as well as a refined core). Clock speed rose to 400MHz. Instruction and Data caches remained at 8K and the 5-stage pipeline was kept. Power consumption was around 400mW, this put the Arca-2 in good competition for other embedded processors. In February 2004 Wyse announced they were going to make a model of their Winterm 1000 series powered by an Arca-2 running at 350MHz. This was a slot previously dominated by the AMD Geode Processor so would be a huge win for Arca. It is not clear if Wyse actually went through with the design however. I have not seen any Winterm 1000 series specs, documentation or devices that actually used the Arca, but it is possible they were used in the Chinese market. Both the WT1200 and 1125 continued to use Geode processors. 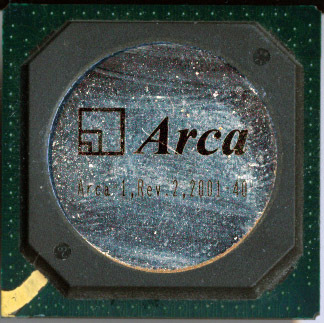 By 2004 Arca was developing a faster processor know as the Arca-3. This was to be made on 0.18u and be clocked at up to 600MHz. In order to reach these speeds the pipeline was extended to 7 stages from 5 and branch prediction was added to help offset the branch penalties from the longer pipeline. Instruction and Data caches were double to 16K each. Around 2006, the Arca-3 was still languishing in development and Arca began to languish in scandals of bribery, and corruption. A DSP designed by Arca (the Hanxin) turned out to be a remarked Motorola DSP56800 processor and funds that should have went to processor development were allegedly used to purchase a new building. 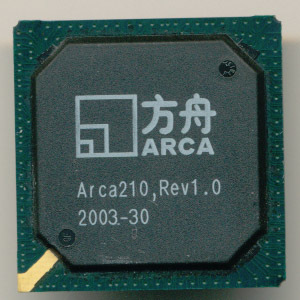 In 2006 Arca purchased a license to the ARM926EJ-S core, effectively giving up on the original Arca architecture. The processors and SoCs using the Arca cores continued to be used in the domestic market, but never in the quantity that Arca, and perhaps the world, anticipated. Today Arca is a design house that makes SoCs based on the ARM and MIPS architectures. The idea of a Chinese IC industry lives on, but it is one based on existing architectures.